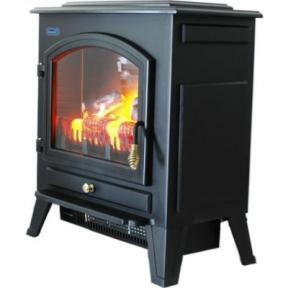 If you love the look of a cozy wood-burning stove, but you live in an apartment, condo, or house without a chimney (and you don't want to spend thousands of dollars to have a real wood stove installed), then you may enjoy this electric heater from Dimplex. Costing less than $200, the Dimplex CS3311 Compact Electric Stove is a heck of a lot less than a real stove (trust me, I was just shopping for one! ), but it has the ambient look and feel of true logs crackling in the hearth. And it gives out warmth too. The fan-forced heater distributes 5,115 BTUs of heat, plenty to warm a room, and unlike the "real deal," there is no venting required. There's an adjustable thermostat, so you can choose how warm you want it to be, but the controls are hidden so they won't break up the illusion that this is a real wood stove. There's also a remote control, so you can lounge on the couch and turn your "fire" on and off from across the room (just try to do that with a real fire). Most of the reviews for the Dimplex are positive, so check it out if you're in the market for an electric heater that looks like a fireplace instead of an ugly old space heater! 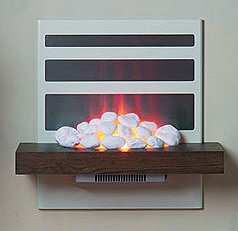 Cost to Run an Electric Fireplace? If you're thinking of buying an electric fireplace this year, you may be wondering how much it costs to run one. After all, you don't want to look at just the initial purchase cost, because there are also ongoing fees due to energy requirements to run one of these units. Generally speaking, an electric fireplace will cost about as much to run as an electric room heater. Many units come with multiple settings, so you would have options such as a 750 watt setting or a 1500 watt setting, letting you choose based on how much heat you need. The actual monthly energy cost will vary depending on electricity prices in your area, but chances are you're not going to see a huge increase in your electricity bill unless you're going to leave the unit on 24/7. Most people flick on their electric fireplace for a bit of ambiance in the evenings. It can also be more efficient to turn it on and heat up the room your family is in, as opposed to turning on the whole-house heat and warming up square footage that isn't even in use. An electric fireplace is actually quite efficient when it comes to zone heating so could save you money if used in that manner. These days, you can purchase a basic unit for less than $200, so it's a fairly inexpensive comfort for the home when compared to other types of fireplaces. A lot of folks who buy electric fireplaces are doing so because they don't have a traditional fireplace, and they can't or don't want to do a heavy remodeling job to build one. However, it's also possible to get an electric fireplace insert, which goes into an existing fireplace. If you rarely find yourself using your fireplace because it's too much hassle to get firewood, bring it inside, build a fire, etc. then this might be an option for you. You get the ambiance and warmth of a fire at the push of a button. And just push the button again when you want to turn your unit off--no waiting for the last embers to die out before it's safe to leave the fire unattended. This Dimplex Electric Fireplace Insert is an example of some of the models out there. You can install it very simply and all it requires to work is a standard electrical outlet. Should You Buy an Electric Fireplace? Is it smart to buy an electric fireplace? An electric fireplace may be the most logical option if you live in an apartment or condominium where there is no existing fireplace. They don't require chimneys or gas lines. Most electric fireplaces are portable, so they can be moved from room to room or even taken with you when you relocate. You could even have one in your college dorm room. These units don't require any remodeling or big home improvements. You can just plug them in to "install" them. You probably shouldn't buy an electric fireplace if you're looking to save money on your energy bills. They're not any more efficient than regular electric heaters (and electricity in general tends to be more costly than natural gas), but they cost more. However, if you want a room heater that can also provide a bit of ambiance (and be better looking than your typical space heater), and electric fireplace can be a good buy. Because an electric fireplace isn't a permanent installation, don't expect it to add to the value of your home. The flames in electric fireplaces look fake compared to the real deal (even gas fireplaces have much more realistic flames). An electric fireplace can be a good buy. Just make sure you're buying it for the right reasons. It's the middle of the summer as I write this, so you're probably not thinking of fireplaces right now (unless it's a backyard firepit), but this is a good time of year to shop for indoor fireplaces and accessories. If you're living in a condo or apartment and can't have a real fireplace, an electric fireplace is a way to get some of the warmth and ambiance (and electric fireplaces are portable, so you can take them with you when it's time to move on). They also make nice room heaters, if you don't want to turn on the central heat and spend money heating all the rooms you're not even using. The price of these fireplaces has been dropping in the last couple years, so it's a good time to buy them. An electric fireplace will cost you several hundred dollars, but if you've already got a perfectly good wood-burning fireplace that you're not using, why not make use of that? 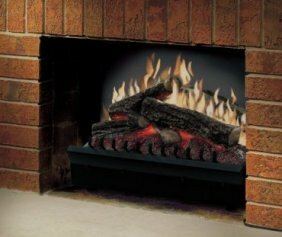 You can get a simple set of electric logs that are designed to be tucked into an existing firebox. Unlike with a regular fireplace, where you have to haul in the wood, light the fire, and keep an eye on it until it goes out, electric logs work with a flip of a switch. True, they're not as cool looking as the real thing, but there's a lot to be said for convenience. And most electric logs can be moved if you want to build a real fire. An example of some inexpensive, but still decent looking, logs is this set from Classic Home Elements. At about $150, they're a lot cheaper than buying a whole electric fireplace (which includes mantle, surround, and all the stuff you don't really need if you've got a fireplace already). You can choose to turn off the heat and just have the flames flicker for ambiance (so, they're appropriate even in warm climates). The ceramic logs that come with electric fireplaces offer a reasonably realistic wood-burning look. You don't need any venting to the outside. Don't plan on using your electric fireplace as backup heating or lighting during a power outage (something you can do with wood or gas units), because it won't work. These types of fireplaces have the lowest BTU output in comparison to other options. Source: September 2006 issue of Home Magazine. Electric Fireplaces, Can They Save on Heating Bills? I caught a Q&A section in an online newspaper that brought up electric fireplaces. Someone was asking if electric fireplaces could save you money on heating bills. I didn't see how since you're still using electricity to heat your home--it's just coming from what is the equivalent of a space heater instead of a central heating system. The article pointed out, however, that a room heater can sometimes be more efficient if you're only interested in heating one room of the house. So, if you spend all your time in the living room, it might be more efficient to run an electric fireplace than have the heat on for the whole house. They are great for people who want to add the warmth and style of a fireplace without building a permanent unit (whether wood-burning or gas), which includes the labor and cost of installing a chimney or venting to the outside. Because the electric units are not actually burning anything (they only simulate flames), they do not steal CO2 or vent potentially toxic fumes. With an electric fireplace, you simply plug the unit into a standard 120-volt outlet and flip the switch. These units can be built into a fireplace surround with mantel and the whole works or they can simply stand against a wall, a scenario that means no tools are required for installation. Many electric fireplaces come with surrounds and mantels to give them a realistic look with no effort. This simplicity and ease is what attracts many homeowners to these appliances. Also, they can be installed in places traditional fireplaces or wood-burning stoves cannot. For example, it's no problem putting an electric fireplace into a trailer or a high-rise condominium. Ok, let's talk about the cons of electric fireplaces, lest I start to sound like a smarmy sales person. For one thing, these fireplaces are basically just glorified space heaters. If all you want is warmth, and you don't mind paying an electricity bill to get it, you could buy a simple heater for much less. The reason people buy electric fireplaces is more for the ambiance and the focal point they can create in a room. They do certainly work as heaters though. Most new models come with a built-in thermostat, so that when the room reaches the desired temperature, the heater automatically flips off. One con of these fireplaces is that they have a bad reputation in that they do not look realistic. After all, nothing is really burning in there, so it's not going to look like a snapping and crackling wood fire. However, the technology is improving, and a lot of today's electric fireplaces use randomized filtering of lighting to simulate glowing embers and flame patterns that are reminiscent of the real deal. The best thing to do is visit a dealer and see a number of units turned on before you make a decision. Now that we have touched on pros and cons, let's take a look at options. Today's electric fireplaces have such perks as built-in fans to distribute the heat more thoroughly, air filtration systems to clean the air as it is heated, a heatless setting in case all you want is the look of flickering flames, and of course most of these units come with remote controls (heaven forbid, we have to get off our couches to turn on the fireplace). Ok, but what about the price, you ask? Electric fireplaces are cheaper than gas fireplaces, and you can get a pretty decent model for about $500 (even cheaper models are available, though they tend to have fewer perks and less realistic flames). Choose the location so the fireplace makes a good focal point to your room; since it's electric, you'll need to make sure there's an outlet nearby. Lay out all the components that came with your pit. The base is probably already assembled. You'll then complete the assembly with the rest of the base pieces as directed in your particular model's instructions. Place the cabinet (the wood exterior part) against the wall and in front of, or near, the chosen electrical outlet (you can hide the cord if you install in front of the outlet). Remove the glass from the fireplace front and take out the box of logs. Plug in the power cord and tuck the firebox into the cabinet. 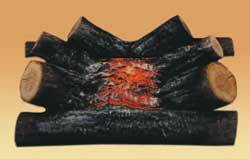 If a liner came with the fireplace, place it in the appropriate spots indicated in the directions. Check the installation diagram to see how best to place the logs. Flick on the power for a moment, to ensure the logs turn on. Turn it off, then screw on the glass front (wipe fingerprints/smudges off both sides before securing it). This is a summary of an article in the Nov 2005 issue of do! magazine. If you can find a copy of the magazine, there are numerous pictures inside.